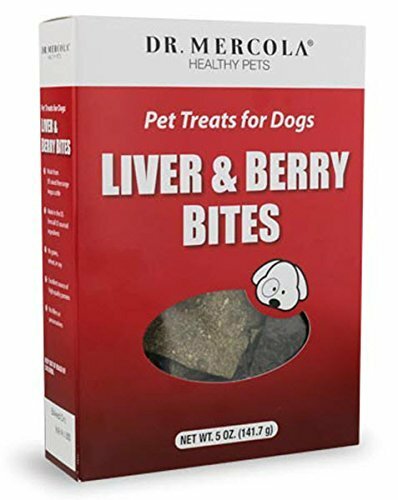 Dr Mercola Liver And Berry Bites are an all natural healthy treat option for your precious pet. Plus, these premium pet treats from Dr Mercola - with beef liver and organic berry blend - have been formulated to meet your best friend's real nutritional needs. Dr Mercola Liver And Berry Bites contain only high quality protein - sourced from USA bred free-range, grass-fed Angus cattle - which has been inspected and passed the USDA meat standards. This means you can rest assured these liver dog treats from Dr Mercola are free from synthetic hormones and rendered by-products. The organic berries in Dr Mercola Liver And Berry Bites are also sourced entirely in the USA to ensure these healthy dog treats are 100% safe and free of any potentially tainted imported ingredients. This premium choice of Dr Mercola pet products also contains no GMO ingredients, artificial preservatives, fillers, grains, soy, wheat or gluten. Just 100% pure nutritious beef liver and organic berries. Dr Mercola Liver And Berry Bites is a rich source of the high quality protein and essential amino acids that your dog requires daily for optimal health. The nutrient-rich, pure beef liver in these premium pet treats helps provide your best friend with vitamin A, vitamin D, all the B vitamins as well as iron and other important trace minerals like phosphorous and copper. While the organic berry blend of pomegranates, blueberries and raspberries helps provide potent antioxidants to boost your pet's overall health. The organic berries in Dr Mercola Liver And Berry Bites are also an excellent source of fiber, potassium and magnesium. Naturally, this premium choice of Dr Mercola pet products is not only nutritious and healthy, but tasty too making them a great choice of dog training treats. After all, your best friend deserves only the highest quality, all natural dog treats. So show your precious pet some love and stock up on Dr Mercola Liver And Berry Bites today.